If there was any doubt about the direction Apple intends to go with OS X, it has been erased. If OS X Lion (10.7) felt like a cloudy harbinger of what might be coming down the road, OS X Mountain Lion (10.8) clearly reveals what’s waiting at the end — and takes us most of the way there. Apple’s plan is to make OS X look and run more and more like iOS. While I have previously fretted about the potential negative implications of this iOS-ification, I found myself breathing a welcome sigh of relief after playing with the developer preview version of Mountain Lion these past few days. My hesitations aside, some sort of convergence of the two OS versions is certainly desirable. As long as we continue to use both Macs and iOS devices, the goal should be to maximize the positive transfer between the two platforms. The question has always been how best to accomplish this. It wasn’t clear that moving iOS features to the Mac was the best direction to go. Indeed, some of Apple’s initial moves in this direction didn’t work especially well. Regardless, with Mountain Lion, Apple has gone full-steam ahead with the iOS-ification of OS X. And it does work. Apple has done iOS-ification right! Notes. 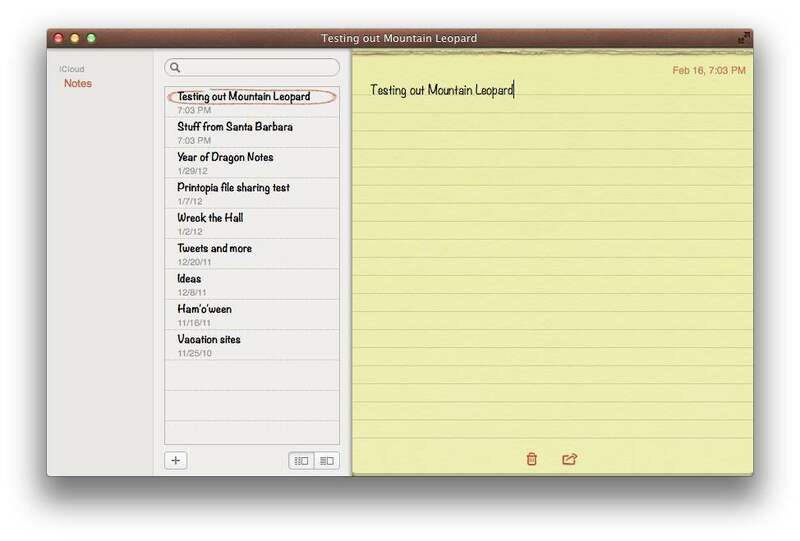 Prior to Mountain Lion, to view Notes documents created on your iPhone, you needed to launch Mail on your Mac and navigate to the Notes section. This was a requirement even if you were using some other email client and would otherwise never launch Mail. You could also go in the other direction, creating a note in Mail and having it sync back to your iPhone. I’m guessing very few users ever bothered to do this; most users probably aren’t even aware this is possible. If this already sounds counter-intuitive, it gets worse (as I detailed in a prior column). Mountain Lion chucks all of that. 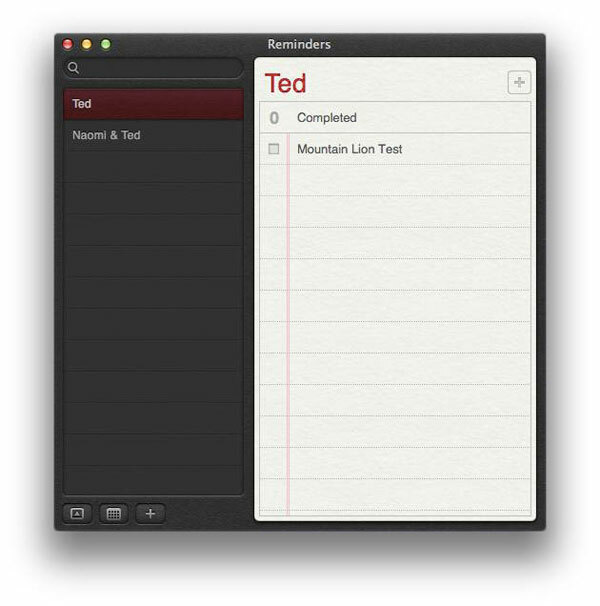 Instead, OS X 10.8 includes a Notes app that looks and feels exactly like Notes on an iPhone. Learn once, know it everywhere! Assuming you are syncing your notes via iCloud (which I highly recommend! ), and assuming you are logged into iCloud on your Mac, your iPhone’s notes will automatically appear in the Mac version of Notes the first time you launch it. No configuration needed. Sweet. As I said, iOS-ification done right. At last. Reminders and Calendar. Prior to Mountain Lion, you created To-Do items in iCal. To access these items on your iPhone however, you did not use the Calendar app. Rather, you launched Reminders (which itself was introduced in iOS 5; prior to that it was almost impossible to access to-do items at all). Mountain Lion dispenses with this jumble of inconsistency. There is now a Mac version of Reminders that meshes perfectly with the Reminders app on iOS devices. To further emphasize the cross-platform match-ups, iCal on the Mac has been renamed Calendar. There is also now a Notifications Center in Mountain Lion, where you can see your calendar appointments and to-dos items with just a click, mimicking the swipe-down action for Notifications in iOS. Very nice. My current choice for favorite new feature in Mountain Lion is Documents in the Cloud. It is not exactly an example of iOS-ification. Rather, it is more an expansion of iCloud. Still, a welcome by-product of this option is the promise of vastly improve file-sharing between Macs and iOS devices (something, as I have written about before, that is much in need of improving). Essentially, this feature allows you to open and save documents directly to/from iCloud via a new section of standard Open/Save dialogs. It appears limited to apps updated to work with the feature (which are very few apps for now). Eventually, I expect it will work with almost every apps. Although I have not seen Apple confirm this, I expect that, for apps that have matching Mac and iOS versions, a document saved to iCloud from a Mac will be accessible to the iOS version of the app — and vice versa. You can already see the beginnings of this in Lion with apps such as Day One. 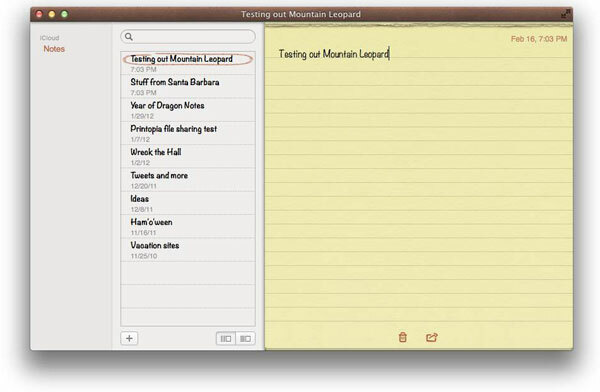 Mountain Lion takes this iCloud-sharing to the next step, providing a built-in way for all apps to accomplish this task. Hopefully, this will be the death knell for the annoying iTunes-based file sharing method. More generally, when this transition is complete, we should see the near total end to local saving of documents. How does iCloud document sharing work? 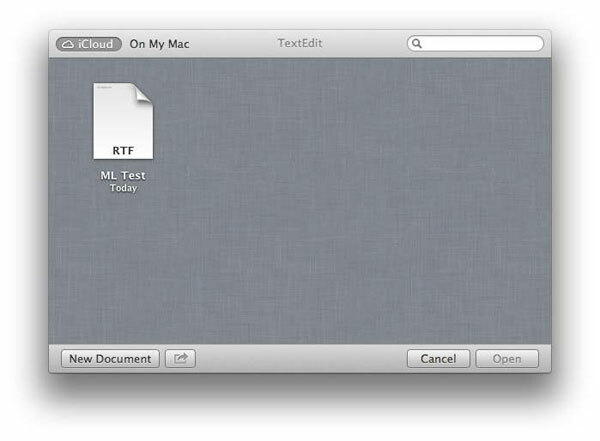 Essentially, it uses the Mobile Documents folder that already exists in Lion (as I have covered elsewhere). This does raise a concern: The Mobile Documents folder is in the Library folder, a folder that is normally invisible in the Finder. Will you be able to search for and locate your iCloud-saved documents in the Finder, without having to make the Library folder visible? Happily, yes. Documents stored in Mobile Documents show up in Spotlight searches as well as in the All My Files view. 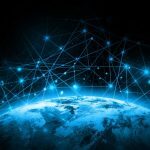 On the other hand, this method limits your ability to combine documents from different applications into a single folder — or otherwise use folders to organize files. For example, I am currently saving all sorts of files related to Mountain Lion in a folder of the same name. There is no way I could accomplish this via iCloud. With iCloud, each document type must reside in the folder for its creating app in Mobile Documents. We may see some added flexibility here in the next iteration of OS X. But I am not expecting much. Apple’s goal is to free OS X from depending on a Finder-like hierarchy of folders, making it function more like how iOS works. As such, I believe it has no interest in making iCloud work more like the Finder. One final question mark: The current versions of Apple’s iWork apps (Pages, Numbers, Keynote) do not support Mountain Lion’s Documents in the Cloud Open/Save feature. Presumably, updated versions of iWork apps will add this support. However, it is not clear how this will work with syncing of iWork documents between Macs and iOS devices. The iOS and Mac versions of iWork apps currently use different file formats for documents. Apple’s current work-around is to have users copy Mac versions of iWork documents to the iCloud website in a browser — and do the reverse for downloading iOS documents to the Mac. Going through the website accomplishes the necessary file conversions (especially critical for downloading back to a Mac). Not only is this a pain, it means that there is no true syncing of iWork documents between Macs and iOS devices; just copying. Will Mountain Lion’s Open/Save approach incorporate this iWork file converting so that the web-based approach is no longer needed? 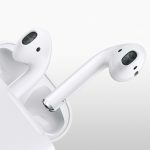 Or will Apple go one better and find a way to unify the differing file formats so that the conversion is no longer needed and true syncing can occur? The latter would certainly be preferred. We’ll have to wait and see. Despite such concerns, my conclusion is clear: When you add up all the pros and cons of file sharing in Mountain Lion, the total comes out on the positive side of the ledger. 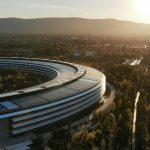 Apple is finally on the road to solving the problems with iOS-Mac file sharing that have bedeviled the company since the iPhone was released. The other point that becomes clear is that iCloud is almost essential in Mountain Lion. 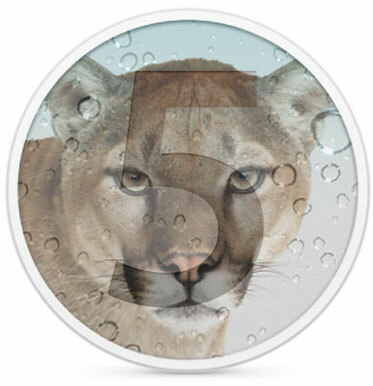 It will be a rare Mountain Lion user that will not be enrolled in iCloud. Essentially, you set your level of protection in the Security System Preferences pane. You can override the general setting for a particular app via a contextual menu option. Overall, this approach appears to be a satisfactory compromise. It allays fears that Apple is intent on completely blocking apps from outside the Mac App Store from running in OS X. At the same time, it improves the app security that Apple offers to end users. • There appears to be no requirements or any review process for getting a Developer ID and signing apps. In other words, Apple is in no way assuring that an app is safe just because it is signed. A signed app that is approved for download simply means two things: the app has not been altered by someone other than the developer and the app has not yet been flagged as malware. 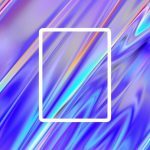 Assuming my assumptions are accurate, it is not a giant leap from what already exists in Lion. Still, it’s a move in the right direction. • It appears that you will be able to download and run apps that are not signed, even if you select the setting to only allow signed apps. The setting means only that you will get a warning; it’s not a blockade. Similarly, if you have previously downloaded and run an app that Apple later identifies as malware, revoking its certificate, this will not prevent you from continuing to run the app. You won’t even get a warning about the change in status. The security setting will only affect new attempts to download the app. Again, this is how I am interpreting what Apple has posted thus far; I may be wrong. What does this all mean about the future of apps sold outside the Mac App Store? Aside from the good news that Apple is not outright blocking such apps, the future does not look very bright. Gatekeeper will encourage more and more users to restrict themselves to App Store apps, making it harder for developers to sell outside apps. 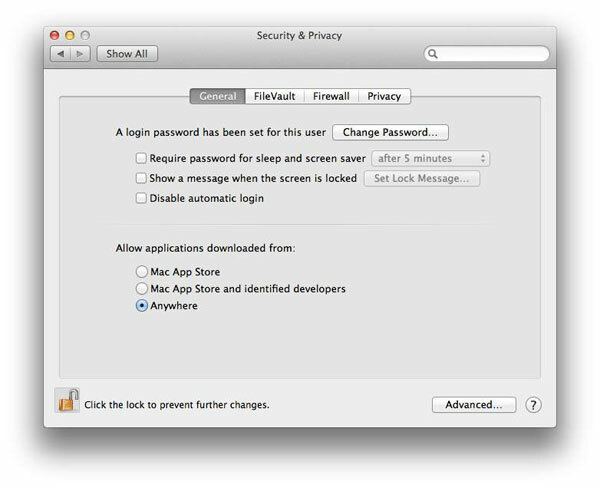 Non-App Store apps will also not be able to access all of Mountain Lion’s features; one notable example is the Documents in the Cloud feature described above. This will make outside apps even less attractive to endusers. Over time, even without any enforced blockade, outside apps are on course to become second-class citizens and ignored by all but a small minority of users. While there are obvious security advantages to Gatekeeper (as well as to sandboxing, a related controversial Mac App Store feature already supported in OS X Lion), this is not a trend I entirely welcome. There are great Mac programs that will never make it into the App Store for one reason or another. It will be a sad day if such apps all but disappear from the landscape over the next few years. After the release of OS X Lion, I became concerned about the negative implications of iOS-ification for the Mac. I still have some of these concerns. For example, Launchpad (an attempt to bring iOS’s Home screen concept to the Mac) is a failure in my view. I never use it. Still, there is room for Apple to improve even this app, by giving users more control over what and how apps appear in Launchpad. Perhaps Launchpad will be a welcome addition some day. That was then. With the forthcoming Mountain Lion, Apple has done a much better job of transitioning iOS features to the Mac. As a result, I am now much more optimistic about the future direction of OS X than I was a few months ago. Going forward, Apple plans to come out with yearly updates to both OS X and iOS. 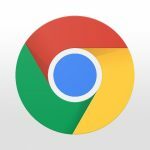 This is another piece of good news, as it will allow the two OS versions to keep pace with each other as new features are introduced. Apple clearly intends to maintain, perhaps even accelerate, the rate of evolution of its two OS versions. For starters, get ready for Mountain Lion. It’s coming soon to a Mac near you.